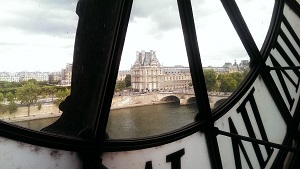 Part 3: A trip down the Sein, a Velotaxi ride and seeing the impressionist masterpieces. It feels like I’ve been to Paris twice, once when Hana and I visited and once as I have lived it again in taking you on a tour through our city break. So far we have visited some of the most beautiful parts of Paris, gardens, boulevards and the classic destination, Montmartre. Today it’s time to take in a little more culture as well as sit back and watch the city go by from both the river and from a velotaxi. 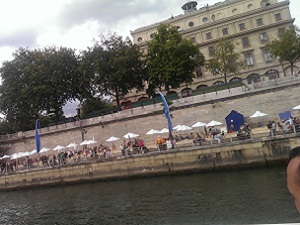 River Sein cruise with Bateaux Parisiens. I always think one of the best ways to get the feel of a city, any city, is seeing it from the river which runs through its heart. Take London. You can walk around all day, all week even looking at the beautiful buildings and sights but you’ll always get the best views from the river. St Paul’s is nestled in the heart of the city, a sunset across the Thames? Beautiful moments which you can capture for every. The relationship between the slow pace of change on the almost static river banks and the constantly moving river itself. The Sein runs through the heart of Paris and, like any good city, most of the attractions and most beautiful buildings border it. The Sein runs through Paris on a curved path and it is this path which leads to the odd ‘left bank’ / ‘right bank’ distinction. It’s one I’ve never quite gotten before – so after a little research this is a helpful way to remember it. When you face DOWNRIVER the left bank is on your left and the right bank is on your right. There is so much to see along the banks of the Sein that it’s best to have your camera on standby the whole time. The Bateaux boats are massive by river cruise standards, vast in fact – the little plaque on the boat said it could hold a thousand passengers! 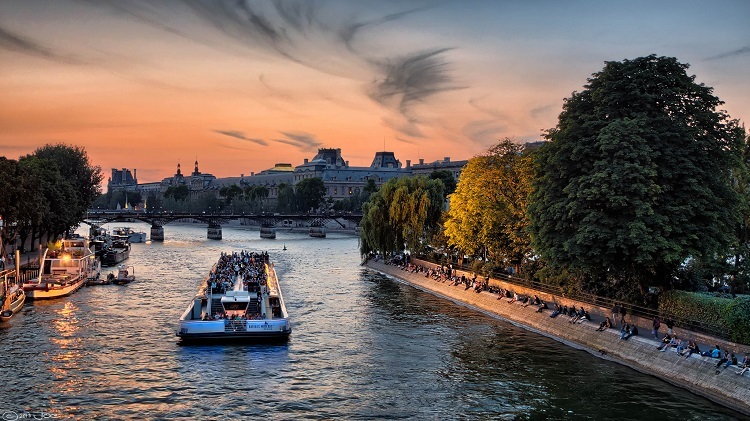 There are several operators running trips on the Seine and they all run the same route of stops along the river, so which ever one you pick you’ll get the same tour experience. The running audio commentary won’t always marry up with what you are seeing, as with any tour like this it has to run through several languages. I found it best to use the map provided which handily has the route and major sights/ building to look out for (plus Google maps is quite handy too). Photo Spots along the River. 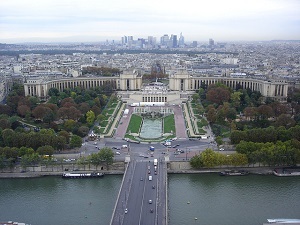 Have you camera in hand from the get go as the first landmark you pass in the magnificently imposing Eiffel Tower. You will gently float past it and as the boat passes quite slowly you should be able to set up for a good shot – excluding mine of course! The boat will turn here and you can get a good shot from the back as it does so. 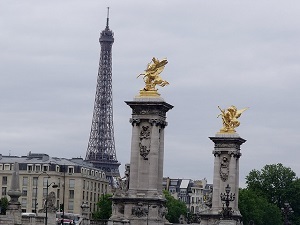 Moving on you will pass under the famous Pont Alexandre III bridge before seeing the Grand Palais on your right. Following on from this there will be the Musee d’Orsay and the Louvre almost opposite each other on the left and right banks. Take the lens cap off again as you approach the Île de la Cité and Île Sant Louis as you should again be able to get some lovely shots of this area and Notra Dame cathedral as you pass. 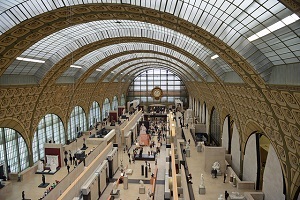 All in all it is a lovely way to spend an hour and orientate you within Paris. 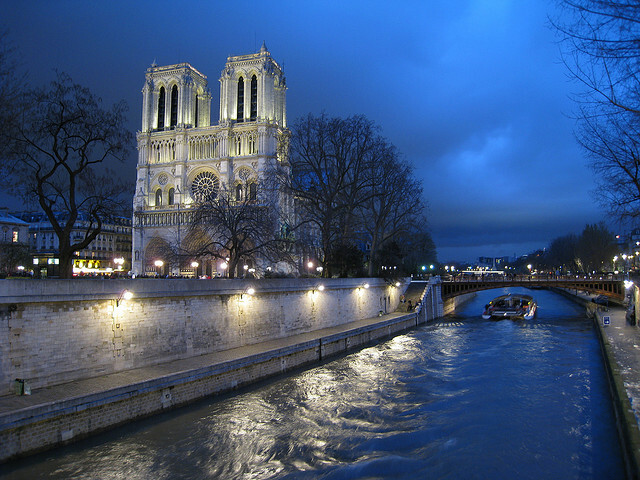 A trip down the Seine also lets you see areas you might want to revisit on foot later. 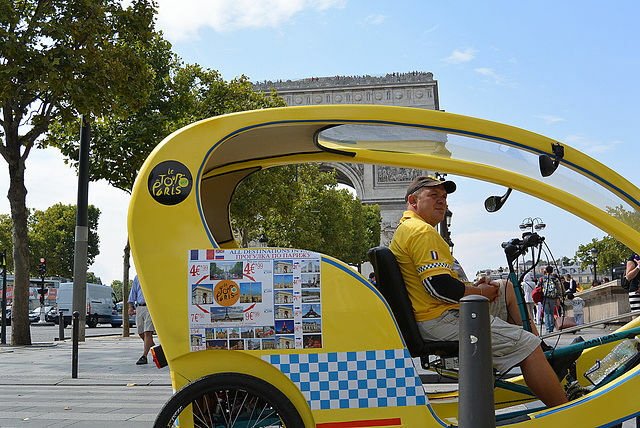 The second type of guided trip most of us tourists take is a ride in a velotaxi. For the uninitiated the velotaxi is a specially built three seat bike/ trike type of thing, you know what this picture is much better than me describing it. 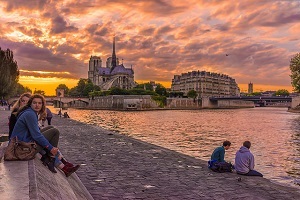 As London has pedalo taxis and tours Paris has a vast number of cyclists based across the city offering 30, 45 and 60 minute tours around that areas famous sights. You won’t go a particularly long distance as you are under human power and flying around the roundabout at the Arch de Triomphe is… well lets say interesting on one of these! But again I think a trip like this gives you another view of Paris and enables you to see how the different areas and sights connect up. We spent a lot of time, as I’m sure many tourists do, going between places using the Metro – so it was nice to see Paris from above. You also get a completely different view of the city from its roads and boulevards. So on a rainy afternoon and with just a few short hours till our train back to London we hopped into a velotaxi by the Arch d Triomphe and asked for an hours tour. We sped off down Rue Victor Hugo before turning and heading towards Trocadero where we caught a great view of the Eiffel Tower again. I’ve probably mentioned this landmark too much but seriously, it’s HUGE! 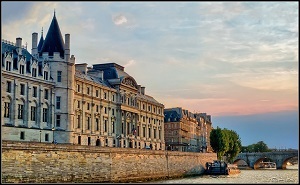 The across Pont d’lena and along the river bank taking in the beauty of the majestic old buildings. At Invalides we hung a right across Pont Alexandre III. Again we passed the sumptuous grand and small palaces before completing our journey with a run up the Champs Elysees. 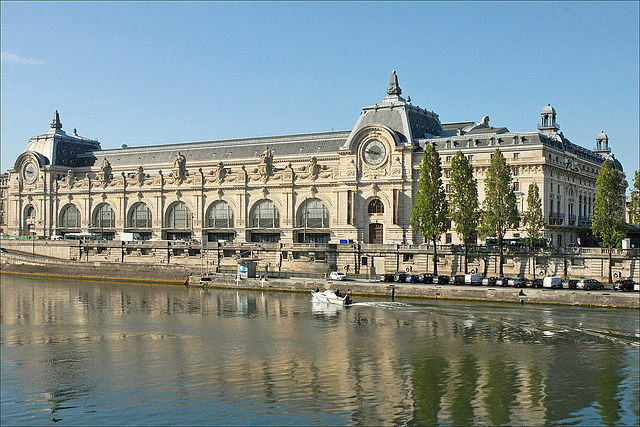 Sitting across from it’s much larger and more famous cousin is the wonderful Musée d’Orsay, home to Paris’s, if not the worlds finest collection of impressionist art. 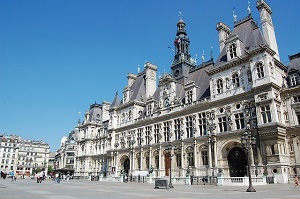 Starting from your approach the area it sits in fills you with beauty, just take a look at the stunning building itself which was once home to the Gare d’Orsay which a generation or two ago whisked people of to South Western France. Today it’s wonderful halls and fantastic roof are home to the museum. I know when you’re in the home of the largest collection of impressionist art in the world you should be heading to see paintings by Renoir, Monet, Gaugauin or Cézanne, but do head to the back of the museum then take the stairs up to the top. Follow them as far as you can up and you’ll find a viewing platform high up in the wonderful metal and glass ceiling with a stunning view below. Now it is an arts museum so we should probably head down and find a bit of it! Let’s begin where you’ll first walk through on entering. The large central hall is home to some wonderful Grecko-Roman sculptures and statues. It was a little difficult to see who they were of sometimes (dam my bad French) but for the most part we figured it our from the description and the statue itself. A lot of people moved really quickly through here, rushing to the impressionist masterpieces but it’s worth taking your time to appreciate them. So onwards and upwards to the main attraction, the impressionists. Most of the paintings here come from private donations to the museum and to the state. It serves as a wonderful national collection preserved for the nation. You can see a good chunk of the museum as we did in half a day. Go on the museum website to plan your visit before hand and check out the paintings and galleries you most want to see. The Telegraph has a great guide to a day at the museum along with a list of the top 20 paintings you should see on your trip. We didn’t make it round all the galleries on our trip or see the whole top 20. I find there is only so much you can see in one day before I stop really taking it in. I recommend heading to the top level and the galleries 29 – 37 for great impressionist works and a lovely view out the window across the Seine.